Earlier this week ADS attended the Women Aviation Leaders Europe Forum organised by International Aviation Women’s Association (IAWA). IAWA aims to cultivate and advance women leaders in aviation and aerospace, providing opportunities for the next generation of women leaders and fostering future development. It represents over 40 countries and over 260 major companies and organisations in the aviation and aerospace industries. The forum held at Aero Club de France in Paris touched on a number of issues, including the future of the aviation industry, disruptive and innovative technologies in the sector, and the importance of retaining talent. The constant theme throughout all these discussions, led by leading business women in the aviation and aerospace sector, is that women are good for business. It’s not just the importance of promoting women to foster creative and interesting ideas within a company (although that is very important! ); it is also the economic outlook and the value of gender diversity to businesses. Several studies have shown that a balanced workforce is good for the customers and consumers, promotes positive workplace culture and is increasingly attractive for investors as it delivers a diversity of thought and ideas. However, despite companies reporting that they are highly committed to gender diversity, that commitment doesn’t translate into meaningful results. A McKinsey study into Women in the Workplace from October 2018, found that women still remain underrepresented at every level and still face discrimination and unconscious bias in the office. Many women still feel that they are the only women in the room at meetings, also referred to as the ‘only’ experience, which makes it more likely to have their abilities challenged. 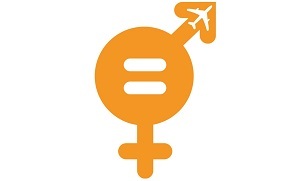 The Women in Aviation and Aerospace Charter is supported by government with both the Department for Business, Energy and Industrial Strategy (BEIS) and the Department for Transport (DfT) being supporting organisations. The Charter forms a part of the government’s industrial strategy and the aspiration for gender balance across businesses. The government recognises that women are good for business, now it’s time for businesses to recognise it too. If you are a company interested in signing up to the Charter, you can find out more from Liam Smith.